Mason traces the migration of the lives and images of native Tierra del Fuegans, a story of gross exploitation, miserable treatment and continual recontextualization. 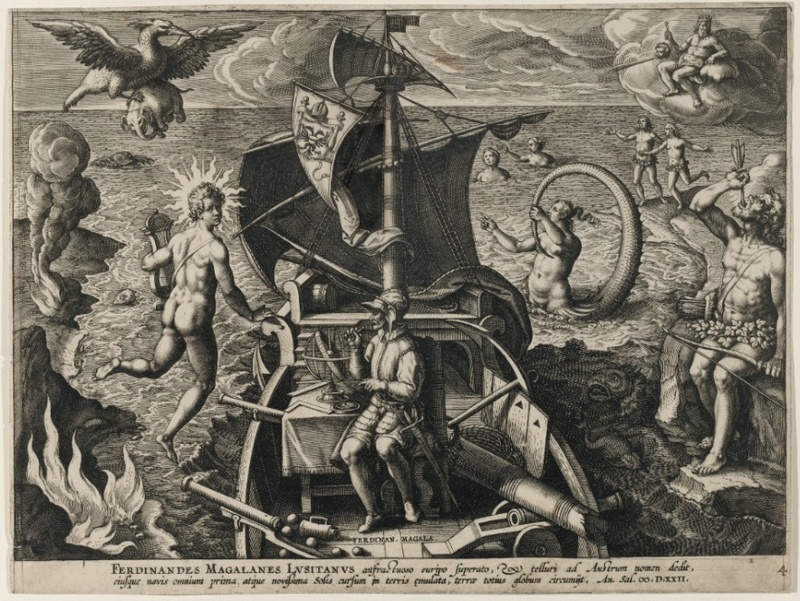 The earliest European representation of a native of Tierra del Fuego, “an engraving of the scene of Magellan’s discovery of the straits that bear his name, also includes a travelling Indian elephant being carried through the air in the talons of a huge bird, the mythological roc, like the great birds or Rukhs, also mentioned by Marco Polo, that carried Sinbad into the mountains by his turban and dropped stones on his ship”. 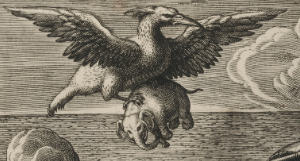 (3) In a strange example of contextual reflux, the elephant resembles representations of Annone, and inspired art historian Rudolph Wittkower “[to connect] this image with Sanskrit representations of the struggle between the eagle and the snake (in Sanskrit epics, the word naga means both snake and elephant)”. (4) Magellan was Portuguese, though he later made the voyage through Tierra del Fuego for the King of Spain. He spent many years in India, including in Cochin serving Governor Alfonso de Albuquerque, and participated in the conquest of Malacca in 1511. Rich with plunder, he sailed home to Portugal in 1512, the same year that Annone made his voyage to Lisbon. You are currently reading The Lives of Images at Annone the Elephant.